Through the hard work of our member libraries and WCCLS staff, we are pleased to announce the new Oregon Chapter of REFORMA! REFORMA, the National Association to Promote Library and Information Services to Latinos and the Spanish Speaking is a professional organization for library staff and library students, and an affiliate of the American Library Association. The new Oregon Chapter of REFORMA will provide leadership statewide to help libraries offer more Latino and Spanish-language oriented materials; to recruit more bilingual library staff; and to encourage new library services and programs that meet the needs of the Latino and Spanish- speaking community. The Executive Board of Directors of National REFORMA approved the Oregon Chapter at their annual meeting this month. WCCLS Outreach Librarian for Latino and Youth Services Program, Martín Blasco, will serve as the inaugural chair of this new chapter. Elizabeth Lopez, a Librarian with the Hillsboro Public Library will serve as Secretary. So... you have a new tablet - what now? Ask a librarian! Is Santa bringing you a new device this year? Before you rush out to spend that holiday cash or gift card on popular e-book titles for your new tablet or smartphone – take the lead from National Public Radio (NPR) and talk to your local librarian. NPR developers recently blogged that public libraries are one of the top two resources for those seeking to read the books that NPR’s Book Concierge app recommends, second only to Amazon. In fact, WCCLS’ own Lisa Tattersall, Adult Services Program Supervisor is the librarian that NPR referred to when they wrote, "it’s always awesome to make librarians happy." Via Twitter, Tattersall encouraged NPR Books to include a link to WorldCat for each book recommended in the Book Concierge. One day later, developers implemented Tattersall’s suggestion, adding a Find at Your Library option. Leveraging WorldCat allows readers across the country to easily locate recommended titles at their nearest library. Locally, Tattersall’s own recommendation is to explore the amazing collection of free, best-selling e-books and audiobooks available for all ages through our website - wccls.org/ebooks. "Wait times are short for new titles in the 3M Cloud Library app," says Tattersall, "and a lot of the best sellers from years past are often available to check out right away." Tattersall also announced that, "due to a recent change, owners of Kindle Fire devices will be happy to know that it is now easier than ever to get the 3M Cloud app on their Fire." Your local librarian can help you find that next great read – one that fits your interests. They can also recommend additional titles based on authors and series you’ve read previously and enjoyed. As a WCCLS patron, you have access to great reads on your tablet or smartphone. Use your library card to enjoy popular titles on your new devices throughout the new year, without spending any extra money this holiday season. Please note most WCCLS member libraries will be have reduced hours for the upcoming holidays... but remember that you can download e-books and audiobooks anytime! Check here for regular WCCLS member library hours. Additionally, please remember that the Beaverton City Library at Murray Scholls will also be closed January 5 - 20, 2015 as they continue construction on their expansion project. The Beaverton City Library at Murray Scholls is expanding! The Murray Scholls library at Murray Scholls Town Center will gain over 4,000 square feet in early 2015 to better serve you. However, to accommodate the construction process, the branch will be closed January 5 - 20, 2015. starting January 5, 2015. The re-opening is currently planned for January 24, 2014. The bookdrop will remain open and items checked out at Murray Scholls will not come due during the construction closure. Find more information regarding your holds, construction goals and updates here. Also, follow progress on the expansion via Beaverton Library's Instagram account. All WCCLS member libraries can serve you during the Murray Scholls closure, and the nearest include Beaverton City Library, Tigard Public Library, and West Slope Community Library. The parking lot adjacent to the Library is now closed. Please use caution in this construction zone and use the indicated pedestrian routes, shown on this map. The Seneca Street extension is now open, as is the new south parking lot. If this parking lot is full, please use one of the other nearby public parking lots. For those with disabilities, there are ADA spaces available in the lot behind the Library. A new drive-up book return has been installed in the parking area behind the Library. The book drops in the front of the Library and at Haggen grocery store will remain open during this construction. Tualatin Library expects to maintain regular library hours and regular program schedules during the construction. We encourage regular Tualatin Public Library users to look for construction updates on the City’s webpage and via City of Tualatin's Facebook page. The Oregon State Library recently reported on 2014 Summer Reading Program statistics gathered from public libraries across the state, and the results look great! Reading during the summer has been shown as one of the most important things a child can do to maintain critical language and reading skills gained over the previous year. Of the 207,449 Oregon kids who participated in Summer Reading this year, 30,126 were from Washington County -- that's 14%! Of the 69,060 participants who reached their reading goals for the summer, 15,039, or 22%, were from Washington County. Way to go, Summer Readers, parents, and libraries! Statewide Oregon Summer Reading participation, 2006-2014. From Oregon State Library Summer Reading Brief 2014. "Say! I like e-books! I do!" 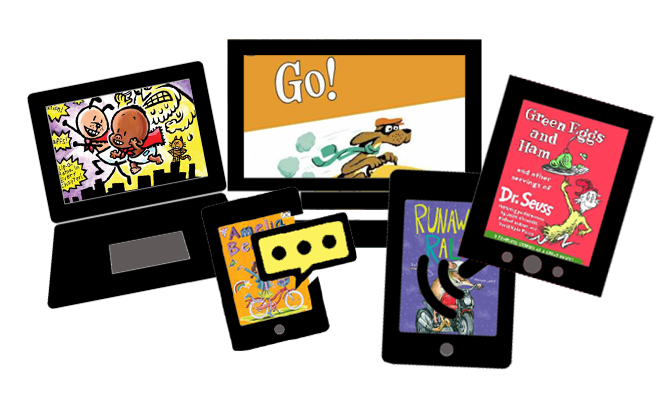 If you're traveling with children this holiday season, be sure to load up your devices with e-books from WCCLS. 3M is our newest collection of e-books. You can download ebooks for all ages through the 3M Cloud Library app on your tablet, phone, PC, or Mac. Overdrive offers audiobooks in addition to e-books, so your family can listen together to entertaining stories on those long road trips. Tumblebooks features online animated talking books for young children. Enjoy peaceful travel, while your kids read e-books "in the rain, and in the dark, and on a train, and in a car, and in a tree.... they are so good, so good, you see!" And download some for yourself while you're at it. "Read them here and there... Read e-books ANYWHERE!" with your WCCLS library card handy. Parody based on the beloved Green Eggs and Ham by Dr. Seuss.